To make Caper & Anchovy Sauce, heat a small frying pan. Place olive oil, capers and anchovies in hot pan, stirring until the anchovies have dissolved. Keep warm until ready to serve. Preheat grill to a high temperature. Season steak with salt. Stand the steak upright (on one edge) on the grill and cook for 10 minutes, then cook 5–6 minutes on each side. Remove from grill and leave to rest on a wire rack for 10 minutes, keeping warm. Heat a frying pan and add olive oil, then add spinach, garlic and chilli and toss for 30 seconds. 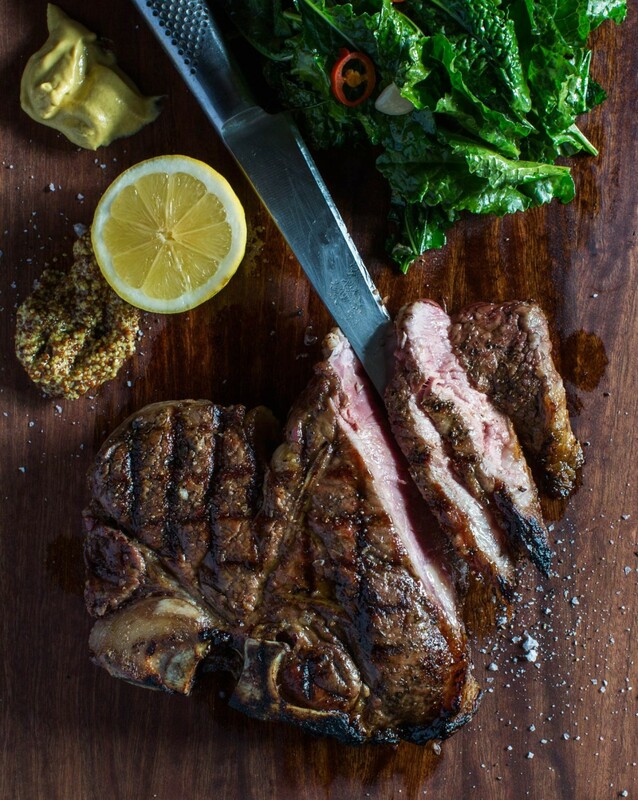 To serve, slice the T-bone steak and plate with the mustards, lemon and Caper & Anchovy Sauce. You can slice the steak at the table if you prefer. Chef ‘s note: The T-bone consists of two cuts: the larger sirloin and the smaller eye fillet.